Optoacoustic tomography is a new non-invasive imaging technique that can help us detect the delivery of blood to different tissues in the body. 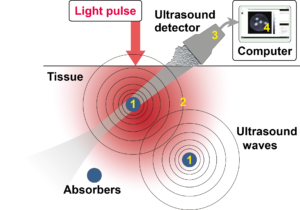 It uses absorption of light pulses to generate ultrasound waves and thus combines the advantages of optical imaging (highly sensitive to the oxygenation of blood, the basis of standard pulse oximeters) and ultrasound imaging (high depth penetration and image resolution, as used to image unborn babies). The process of optoacoustic tomography involves four steps as illustrated in Figure 1. First, light is delivered into the body and is absorbed by light absorbing molecules (called “chromophores”), one of which is the haemoglobin molecule in red blood cells. 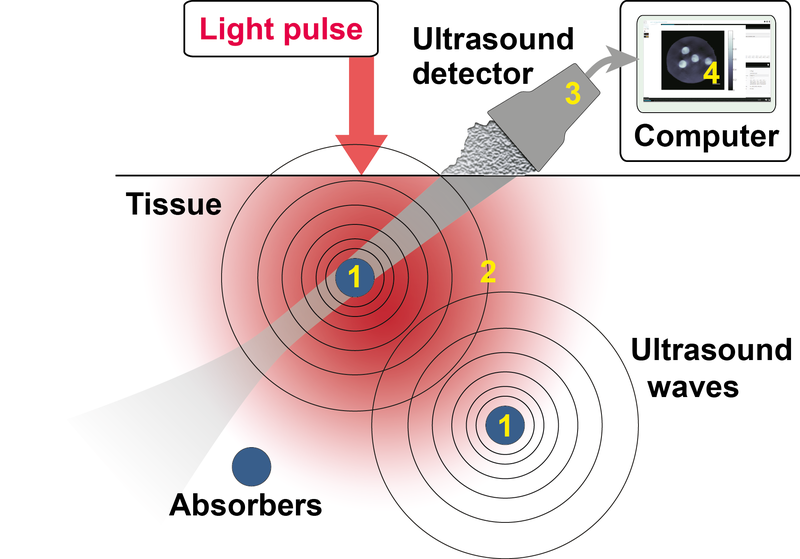 The absorption of the light by chromophores leads to a temperature and pressure rise and consequently generates ultrasound waves (step two), which are detected at the surface (step three). Our work focuses on step four, which is the data analysis process required to recover an optoacoustic image from the detected ultrasound waves. Figure 1. Illustration of the steps involved in generating an optoacoustic image: a pulse of light is absorbed (1) leading to generation of ultrasound waves (2), which are detected at the tissue surface (3) and then reconstructed (4) to form an image. Using different colours of light allows us in principle to calculate the oxygenation of the haemoglobin in blood. This is possible because haemoglobin has distinct spectra (characteristic absorption for different colours of light) depending on whether or not oxygen is bound to it. The blood oxygenation can inform us about the oxygen delivery in diseased areas, which is often lower in tumours as they tend to have a highly inefficient supply of blood vessels that are chaotic and randomly oriented compared to surrounding healthy tissue. The challenge arises in trying to extract a quantitative measure of the haemoglobin concentration from the optoacoustic image. This is because the intensity of each pixel in the image depends not only on the concentration of haemoglobin in that pixel, but also on the intensity of light (or the light “fluence”) reaching it (deeper areas receive less light than shallow areas due to attenuation). To address this problem, we have developed an optimization procedure to estimate the light fluence in a living subject using a mathematical model of how light propagates in tissue. This is the basis of our paper and is illustrated in Figure 2. The procedure starts with the initial optoacoustic image, which is reconstructed using a standard method. By looking at the image, we can segment it into regions, and using what we know about the structure of the body we guess the amount of light absorption and light scattering we would expect to occur in each region. Using this initial guess (which makes for fast calculations if it is close to the actual solution), we can calculate the distribution of light fluence across the image and determine what the image would look like in this case. 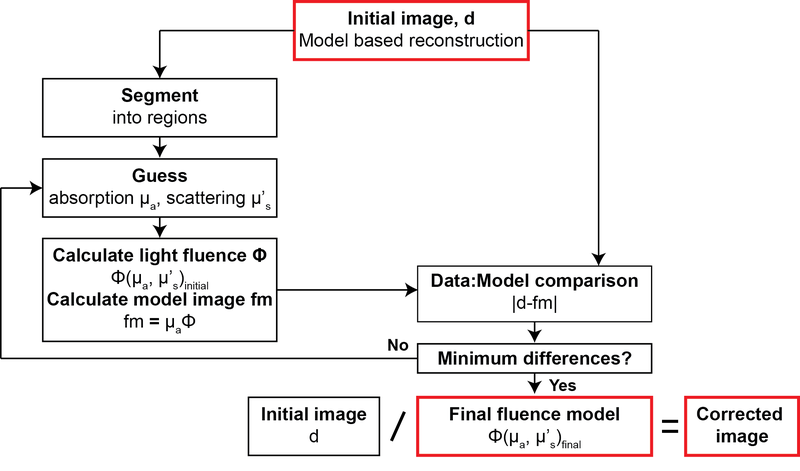 We check whether the model image (fm) represents the real image data (d) we first acquired. If it is different, we guess a new set of parameters for absorption and scattering, and this generates a new light fluence map. We keep repeating this process until only a small difference between the image model and image data remains. 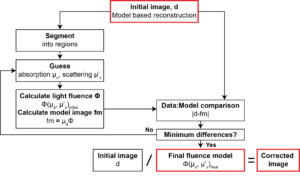 Then, we divide the image data by our final light fluence model. In this way we can correct for the effect of light fluence, which should in the long term help us to extract that quantitative measure of the haemoglobin concentration. Figure 2. Schematic of the optimization procedure used to estimate the light fluence and perform fluence correction. We then performed a series of tests to show how this method of fluence correction works in practice. First we took images of gels and dyes that are similar to body tissue in the way that they absorb and scatter light. The raw images did not show accurate spectra, but we corrected the errors using our fluence model. The result was a good (linear) match between the numbers extracted from the image and the known properties of the gels and dyes. So then we took the test a step further: we obtained some optoacoustic images of living subjects. 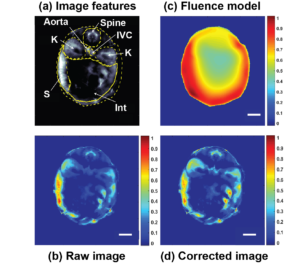 Figure 3(a) shows the key features of a typical image, and the raw optoacoustic image is shown in Figure 3(b). It is difficult for light to penetrate into the centre of the torso, and this makes it hard for us to see the organs deep inside the raw images. However, when we correct the image using the fluence model (plotted in Figure 3(c)) we can see the central organs more clearly, as shown in Figure 3(d). The results in this paper demonstrate the success of our fluence correction method. It enables us to improve the optoacoustic image quality and paves the way for quantitative measurement of haemoglobin concentration and oxygenation. Ultimately this will allow us to accurately measure blood oxygen levels and so understand the oxygen delivery to different parts of the body, helping us to improve our diagnosis and staging of diseases such as cancer.